This is little Laelia’s leg. The arthrogryposis in her hips doesn’t allow her to bring her legs/knees together (although they can be manipulated that way; it’s one of her stretches), and it causes one leg to always stick up in the air when she’s on her side. It’s a strange sight–now that she’s more mobile–to see this little leg hopping slowly across the carpet. Or at least that’s my view from the couch looking over our long coffee table. It looks just like a little fin peeking out of the water. Or a little telescope out of a submarine, betraying something larger below the surface. Then sure enough she pops out the other side, or rolls towards the television, and I see that the little leg-fin has a Laelia attached to it! 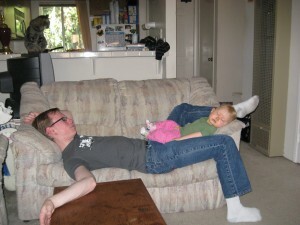 I love the title of this blog because this defines my daughter so well! Laelia getting stretched and flirting with the camera. I wanted to share a quick thought before I ran Laelia out to the store. I guess I just wanted to try and express how wonderful life is with this little girl! Around this time last year I was finally starting to get over the debilitating grief and guilt that I think naturally comes with having a disabled child. It just happened to stick with me longer than stronger parents. Now it’s amazing how I don’t have any traces of that grief or guilt on a daily basis! There was a time I never thought this would be the case. I saw other families tell me how life with their special child(ren) was normal for them, but I secretly didn’t believe them! But life is normal! It’s fine. And it’s rare that I think of her as “disabled.” In fact now that she can feed herself and drinks by herself, it’s even more normal. 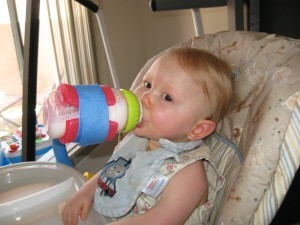 Today for the first time ever she fed herself from a sippy cup (see previous post). We bought the Mother’s Third Arm (months ago from overseas) at the suggestion of the AMC support group’s website and I just got it in the mail today. I hooked it up to her highchair and watched her little mouth get all excited as her lips struggled to get ahold of the magically floating sippy cup. Then she would get distracted by birds outside, then go back for a drink, then stop drinking to tell me something, then drink again, then yell at the cat before sticking her little face right back on the sippy cup! It was pure fun for me to witness! Six days ago she fed herself a snack for the first time. I just can’t express how happy and excited I am at the prospect of her being independent in one more way! 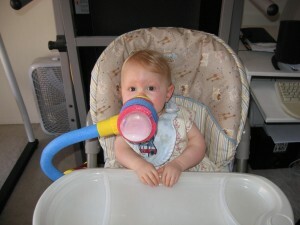 In OT we’re working on feeding herself more things in more ways! After that we’ll work on mobility! 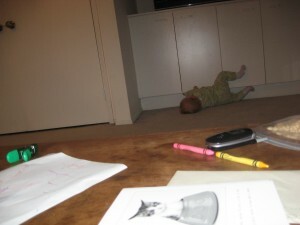 (She’s already rolled across the Fehrenbach’s living room!) I can’t wait! 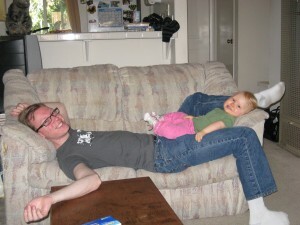 Here are three videos that show off her adorable, rambunctious and independent ways. Adorable: Laelia listening to the new Josh Damigo single. Rambunctious: Laelia and her duckie. Isn’t she precious?! I’m not gonna lie and say I never get sad when I find out there’s something she can’t do. Or that I didn’t get down when the Regional Center stopped by on Wednesday to do their assessment and we took “standing” off her goals list. And I fall into the same trap many parents do when they compare their kids to other kids. But besides those moments in life when we remember what we face, there’s a normal daily life we get to live that is a gift, a blessing. On a daily basis we just simply enjoy her. Even stretches!–those awful therapy sessions when she cries–are becoming just a normal part of life. Just like shots or sickness or any other not-so-fun thing is a part of a child’s life. I really wouldn’t be here, at this place emotionally, without my wonderful church, friends, family and those strangers who email me all the time! Haha! There’s a few people I consider friends and I’ve never met them in person! It’s amazing! Then there’s Chelsea, Farhia and Lauren doing stretches that’s made a huge difference for us. And then there’s the wonderful Respite program through the YMCA (i.e. so many hours a month of free babysitting for special kids) which has been one of the best things to ever happen to this family of three! We have a great support system! So THANK YOU! Okay going to the store now. 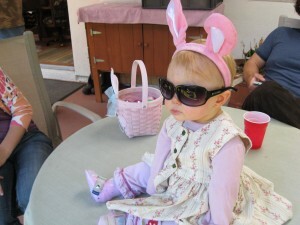 Laelia’s Easter at the Fehrenbachs! Laelia had a great time at the Fehrenbachs! 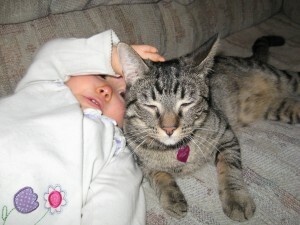 They have become like second grandparents (or aunt and uncle–they’re still young :)) to her. Before you click on the picture above to see the rest of the pictures, let me give you a brief summary of the day. When we arrived there was an Easter basket waiting for Laelia that was as big as she is! It was filled with bubbles and toys! Then Laelia took her basket on an Easter egg hunt with the other kids. They hid Easter eggs up high just for Laelia to find. Charley carried her around, Chelsea followed close behind with the Easter basket as I took a ton of pictures. Then there was a ball pit for Laelia to play in. 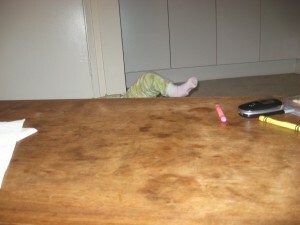 Then Laelia rolled across the Fehrenbachs’ living room floor–being the farthest distance she has ever rolled! Then she played pretty hard for a while. She had a blast! And us parents had fun too. All in all a great day! Lali partied so hard, in fact, that she fell asleep as soon as her tush hit the car seat for the long drive home. Hoppy Easter! Enjoy the following links of Easter videos. Laelia picks up an Easter egg and puts it in her basket herself. Laelia shares her Easter eggs. Laelia in the ball pit. Laelia and Adam and the ball pit. Here’s an embedded video for those of you who can’t use the links on the previous post. This is Laelia feeding herself for the first time ever! Laelia’s petting skills came in handy today. Laelia fed herself! All by herself! For the very first time ever today! I didn’t have to force her hand into a certain position or help her in any way! She used her petting skill–the jerking her more flexible right hand over her head by her shoulder then relaxing her tricep to bend the elbow. She’s amazing! It happened at OT (occupational therapy). Today was just a great therapy day in general. We had two not so great PT (physical therapy) appointments in a row so we were due a better visit from the child development people. Anyway, first we got Lali’s splints adjusted so they fit better. I like them a lot. Also we found out we had overpaid a few copays this past year and got a $45 check back. Woohoo! Thank you very much. Then we got to meet another baby with arthrogryposis and show his mom and grandma that it would be okay. Lali showed off for him by picking up blocks and using the orthopedic gear like a pro. At one point the OT was talking about elbow ROM (range of motion) and showed how, with daily stretches and continued therapy, he would be able to do this (then she demonstrated Laelia’s elbow ROM). It was fun to be the show and tell. Laelia is happy to be the center of attention and get all the praise any day. Then we continued to work on self feeding with Laelia. (I like this part because I always get to demonstrate eating the snacks. :)) This is a goal we’ve had for a while now. Laelia turned a year and a half old just four days ago and I was starting to think that without biceps (which she’s missing entirely) or more flexible elbows (because of her joint contractures) feeding herself was a long way off. (Oh and did I mention her inverted shoulders and weak grip that makes even getting the snack facing the right direction and staying in her hand a challenge?!!) Well we got some pretzels and she came really close! We were amazed! But her elbow was too stiff to get any closer to her mouth. Then eventually she worked her pretzel even closer. And that got us excited so we shouted “Yay! !” which made her tricep fire up and zoom that arm shot away from her mouth. Wrong way! But eventually, though, she did manage to bite off the tiniest bit of the end of her pretzel! Here’s a cute one of her trying to feed herself the first time we put it in her hand. She doesn’t quite make it, but it’s so adorable! Laelia continues to feed herself and then scoots over to share with me. Tongue inspection! Open wide! See! No piercings! We had a great April Fools day today! Lots of pranks! I know a few of my coworkers will probably never trust another textbook order they get from me on April 1st ever again. My car took the brunt of the revenge. All in all a great day! So Laelia never bit her tongue and has no tongue ring! I promise! 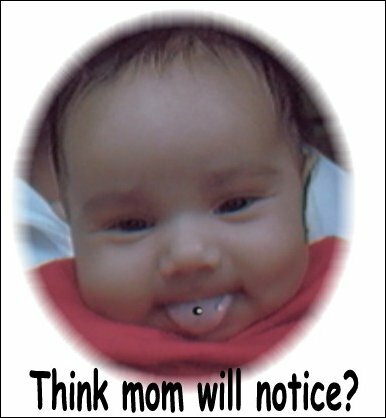 Can’t actually pierce the kid’s tongue–then she wouldn’t have something to impulsively do in a moment of teenage angst. Although I did forshadow this tongue piercing gag last year. Ah last year… let’s reminisce! Then of course here is the link to my apology last year: SORRY! Hehe, oops! Anyway, so it left a mark on her tongue that bugged me to no end. So after consulting with her pediatrician we decided to plug it so as not to cause her trouble eating or drinking her milk. A little clear plastic plug was inserted right into the hole (which was more of an indent than a hole). When they were placing the plug, the nurse noticed that she could get the plug all the way through. (Sure after poking around like that!) This caused them to decide not to use that specific plug and instead use a longer plug to go all the way through the tissue. This will keep food particles and bacteria out of the hole. So even though it’s off center, our baby how has a tongue piercing! I went to the mall and picked up a little plug that was silver instead of the functional-but-ugly clear one and it works great! Plus now it looks like baby’s a punk star or something. Since Lali already has earrings and now a tongue piercing, I finally convinced Charley to let me pierce her nose. It is a cultural tradition on my mom’s side of the family (not recently, but historically). I’m really excited about it. So far I haven’t been able to find someone who will do it, so maybe I’ll try it myself. I’m reading up on the Internet about it. It’s about time people shed their delicate American sensibilities when it comes to cultural traditions! I may even do Lali’s left eyebrow as a sign of peace between all nations. Or maybe the eyebrow would be foolish. Hmmm… this April there are a lot of fools piercing their kids’ eyebrows. Don’t want to come across too trendy.